The reason many people can’t fathom the notion of the National Football League (NFL) as a tax-exempt entity (it’s a 501(c)(6) business or trade association) is that it operates like a business entity rather than simply representing and advocating for the needs of its membership of NFL teams and their owners. For example, take the NFL’s negotiations with the city of Santa Clara, Calif. as a possible site for the Super Bowl in 2016 or 2017. Santa Clara, where the San Francisco 49ers are constructing a new $1.2 billion stadium, is competing with Miami and Houston for the Super Bowl designation. The NFL wants concessions from Santa Clara on what the League will have to pay to lease the facility for the event and, according to NBC Bay Area, “may also ask that its employees be exempted from paying local sales tax while they are in town.” NFL spokesperson Greg Aiello says that the NFL requires cities to eliminate sales tax charges on Super Bowl game tickets, which we think are somewhat pricey. A ticket to this year’s Super Bowl in New Orleans ranges from $2,799 in the nosebleeds on up to $7,999 for an ideal seat. Facing NFL requests to cough up some tax revenue, the question for Santa Clara officials is how much the city and the region would benefit in return for the incentives they will have to give the NFL to win out over the competition for the honor of hosting the first Super Bowl in Silicon Valley since Palo Alto, Calif. hosted Super Bowl XIX in 1985. However, because this would be a Super Bowl in the home stadium of the San Francisco 49ers, many or perhaps even most of the events surrounding the Super Bowl would be likely to happen in San Francisco, not Santa Clara. Santa Clara officials are therefore looking to see how suburban hosts of Super Bowls—such as Glendale, Ariz. and Arlington, Texas—have fared in hosting their Super Bowl games. Some people cite a figure generated by the NFL that hosting a Super Bowl is worth $300 million in economic benefits to the host community and region. To be fair, the League is probably asking no less of the other competing cities. According to Santa Clara City Attorney Ren Nosky, “We have to give up something financially.” The explanation, according to Nosky, is simple: “The NFL being the NFL, they obviously have the wherewithal to try to impose certain concessions from the host cities.” The possibility, not the promise, of hosting a Super Bowl is one of the incentives the NFL dangled before the Santa Clara City Council to get it to borrow $850 million from Goldman Sachs to finance the construction of the 49ers’ new stadium. 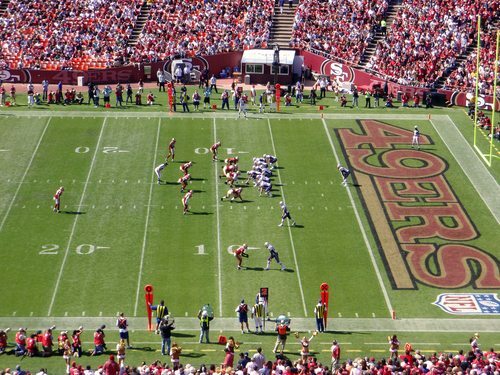 Like many professional sports stadiums, the 49ers’ Santa Clara facility is dependent on the support of the taxpayers, but the requests the NFL makes of taxpayers doesn’t just stop when the last brick is laid. Owens essentially charged the NHRA with operating a for-profit business under the guise of a nonprofit trade association, noting that the NHRA’s business model is like for-profit competitors such as the National Association of Stock Car Auto Racing (NASCAR) and the International Hot Rod Association. He also mentioned that at one point, the NHRA offered to sell part of its assets to a for-profit entity called the HD Partners Acquisition Corporation. Owens also noted that the NHRA directors were not independent directors and hinted that they operated like and could be treated as “private shareholders” of a commercial endeavor.